Under these new changes, if accepted by the School Board on November 20, students across the street from Eckstein Middle School would no longer be attending there. Instead, all students currently attending Wedgwood Elementary would begin attending Jane Addams Middle School. North Seattle Accelerated Progress Program (APP) middle school students would be moved from Lincoln Hamilton into Eckstein. Proposed Northeast Seattle middle school boundaries. If accepted, these changes would be implemented in the next two years. The documents outlining these proposed changes were last updated on October 31, and released the next day, at 7 PM. On a Friday night. So many families in the affected areas may just be hearing about them. 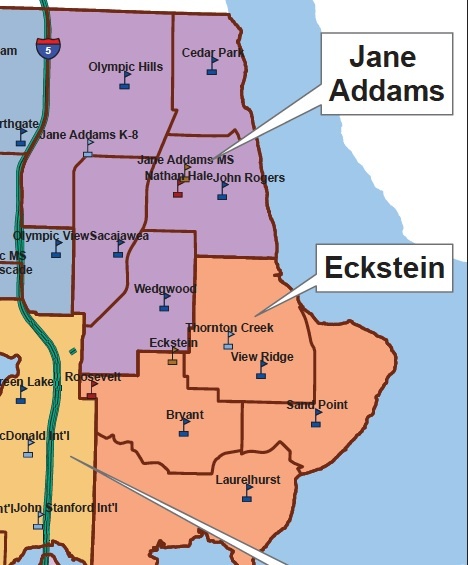 Starting next school year, ALL Wedgwood students would be assigned to the new (as yet unopened) Jane Adams Middle School (6-8), even kids who live across the street from Eckstein. 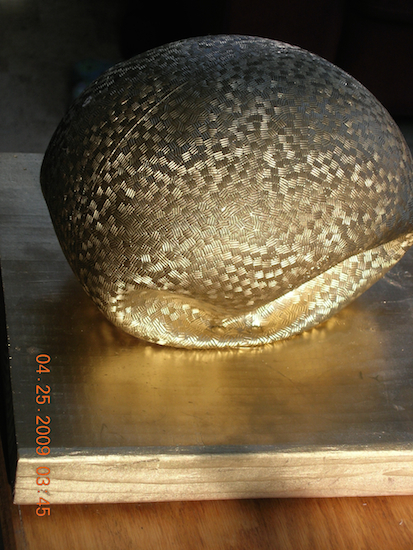 A full copy with details of the plan is available on-line here. This plan was devised after community feedback to the previous October 16 proposal. No major changes were proposed for our school at that time and thus there was no call to action. Now our community needs to respond quickly if we wish to impact this process before it is too late. In addition to expressing thoughts/concerns to School Board members, parents should also email feedback to GrowthBoundaries@seattleschools.org, the official Seattle School District boundary plan address. Put your school or issue in the subject line. For the full list of information about these proposed changes (including the data used to create them), visit the Seattle Public Schools — Growth Boundaries page. On Friday evening, the Seattle Public School district released their latest proposals for updating school boundaries. The district will present this proposal to the Seattle School Board on Wednesday, November 6th. If you would like to speak directly to the board regarding this proposal at the meeting, you may, but you must call the district and sign up on Monday (11/4) morning. The SNAPP PTA maintains its position that splitting the APP Middle School and co-housing with attendance area schools is not in the best interest of our community or helpful with the overcrowding in the north end. Although many APP MS students come from the Whitman and Eckstein reference area, putting APP in these schools would only serve to further crowd them and keep reference area kids out. You can read the entire APP @ Lincoln PTA statement here. Current APP middle school students do NOT attend Lincoln- in the North, they go to Hamilton and will continue at Hamilton in the proposed plan, for now, as well as Eckstein and then Whitman. I would also like to note that APP has advocated for its own Middle School site – at Wilson Pacific and never advocated to be at Eckstein as we know that school is already crowded as a neighborhood school. UPDATE (Tuesday, November 5, 7:03 PM): Those that emailed Seattle School Board Member Harium Martin-Morris received the following email in return, outlining an amendment Martin-Morris plans to introduce at Wednesday’s meeting. NOTE: While most local residents probably assume (correctly so) that most Ravenna neighborhood students attend Bryant Elementary, many in the North Ravenna area (including those here at Ravenna Blog Headquarters) are located within the Wedgwood Elementary attendance area. In fact, the boundary for Wedgwood itself is planned to expand further into Ravenna in the coming years (reflected in the image above). APP students are scattered throughout neighborhoods, and all currently attend school at old Lincoln High School in Wallingford (see Elena Waite’s note above). Lincoln was closed in 1981, and is used as an interim location for Seattle schools and programs. 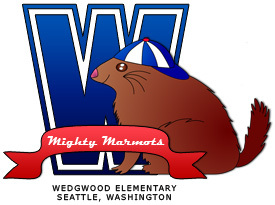 Wedgwood Elementary’s PTA president and vice-president will also be attending the chats. Over the next several weeks, I will be hosting a series of informal coffee meetings for parents, the first of which will be on Tuesday, January 17thÂ from 9:00 to 10:00 am.Â The purpose of these meetings is to give parents a chance to come and ask questions about any issues they are thinking about, and discuss these issues with others in the community.Â In addition to myself, Katie Traverse and/or John Piccola, our PTA President and Vice President will be there to chat with folks and answer any questions about the PTA. I want to make it possible for everyone who wants to attend one of these coffees to do so.Â For that reason, they will be offered at two different times – one in the morning right after the school day begins, and one in the evening off campus. If none of these times work for you and you are interested in attending, please let me know.Â I look forward to meeting with many of you in the following weeks. While Wedgwood Elementary School itself (2720 NE 85th Street)Â is located in the Wedgwood neighborhood, a chunk of northern Ravenna is within the school’s attendance boundary (which you can see here; 421 KB PDF).